10 Zinc Supplements for Better Skin and Immune System Support! Zinc is an important mineral that protects our immune system as well as our skin and nails. It helps with hormones, thyroid, and proper blood sugar function. It’s especially great for protecting us from colds and the flu. It’s a necessary nutrient and if you aren’t getting enough, here are some ways to supplement. All the products below are vegan and available on Amazon. Our veggie pills are Vegan, Non-GMO, certified gluten free, Gelatin-Free and chemical free. They are also free of wheat, dairy, soy, yeast, sugar, sodium, artificial flavors, sweeteners, preservatives, colors, milk, peanuts, shellfish or fish. Suitable for kids, vegetarians and perfect for vegans. 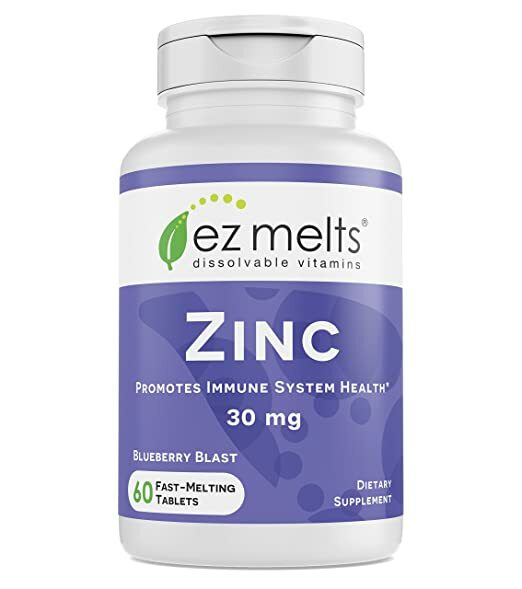 EZ Melts Zinc for Immune Support promotes protein synthesis and healthy hormone levels, and supports skin health and cellular renewal. This product includes 60 fast melting tablets with “Blueberry Blast” flavor. It’s gluten-free, non-GMO, and sugar free. It’s made with natural flavors, natural sweeteners, natural colors, and is vegan! The price is $15.99. 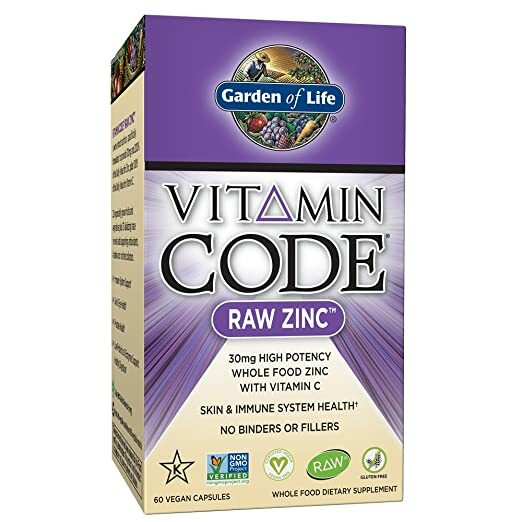 This Garden of Life Vitamin Code Raw Zinc supplement not only contains 30mg of raw zinc (200% DV), but it also contains raw vitamin C (100% DV). The capsules also contain a RAW Veggie Mineral Blend of 17 organically grown vegetables & 75 ancient soil based alkalizing trace minerals containing natural cofactors. It was created to help with skin health, eye health, prostate health and immune system support. On top of being raw and vegan, it’s gluten-free, dairy-free, non GMO, and contains no binders or fillers. The price for 60 capsules is $9.79. 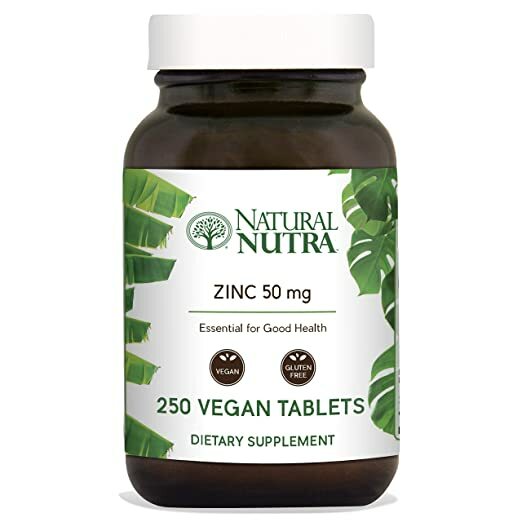 This Natural Nutra Zinc Gluconate supplement contains over 333% of your recommended daily dosage. It helps prevent colds and flu by protecting the immune system. This product comes in BPA-free, fully recyclable glass bottles. The tablets are easy-to-swallow, vegan, and gluten free. A bottle of 100 tablets costs $15.95 and a bottle of $250 costs $22.95. 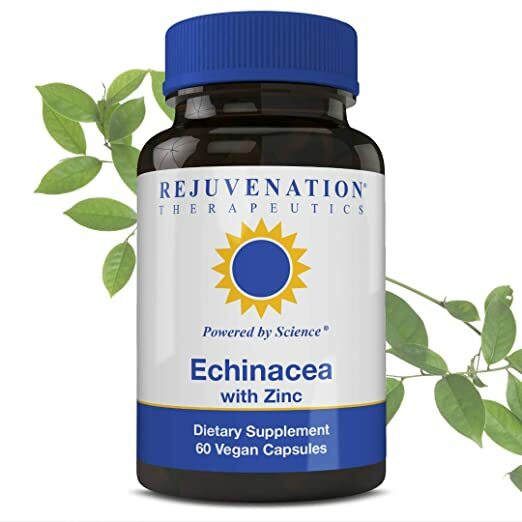 Zinc is great at boosting the immune system, but echinacea is also great at supporting the immune system and preventing sickness. It has antimicrobial and anti-inflammatory properties. This Rejuvenation Therapeutics supplement has the powerful combination of both! The capsules are dairy-free, gluten-free, preservative-free, additive-free, vegan (of course!) and the bottle is BPA-free. The price for 60 capsules is $9.95. 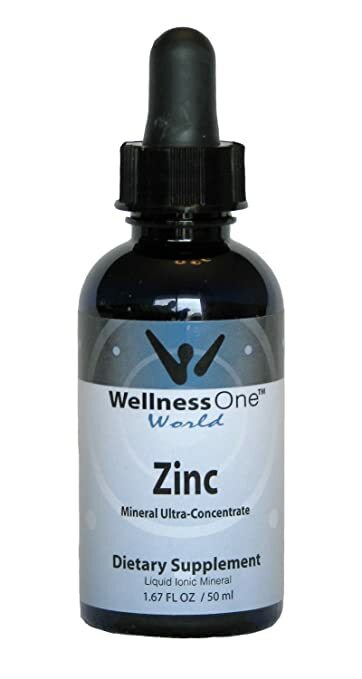 WellnessOne Zinc Liquid Ionic Mineral Supplement comes with a glass dropper and if you don’t want to take it on its own, it can be mixed into coffee, juice, or food. Because the zinc is in an ionic form, the body may even break it down more easily than most capsules or pills. Just 10 drops gives you 15 mg of zinc sulfate. The bottle has a total of 100 servings and costs $19.95. 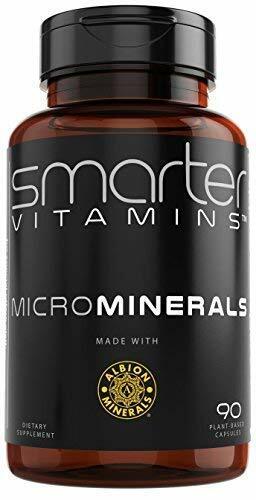 The SmarterVitamins Powerful ZINC Glycinate is a multi-mineral supplement with more than just zinc. It also includes Selenium, Manganese, Boron, Chromium, Selenium, and Molybdenum. The combination of these micro minerals can benefit Cellular Energy Production, Hormones, Neurotransmitters, Metabolism and DNA. These capsules do not contain any fillers, dioxides, silica, maltodextrin, soy, milk, egg, corn, tree nuts, artificial colors, or preservatives. The price for 90 capsules is $19.99. 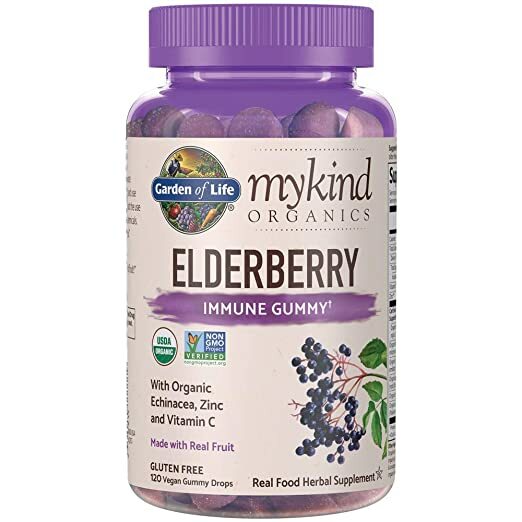 These Immune Gummy supplements contain organic Echinacea, zinc, and vitamin C. They’re made with real fruit and do not contain animal gelatin or refined sugar. Because of their easy to consume gummy, form, these are great for children as well! The price for a bottle of 120 gummies is $24.49. 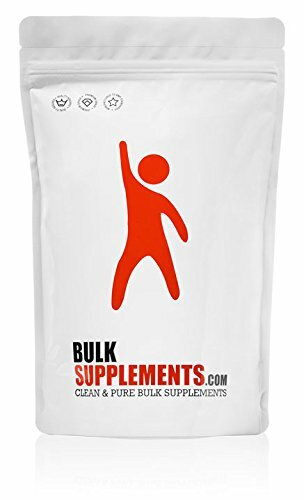 This Zinc Citrate Powder is great for those who don’t want to take a capsule, liquid, or gummy supplement. This can be incorporated into liquids, smoothies, or any other way you prefer your powder supplements. It arrives in a factory-sealed foil zip pouch and is non-GMO. Like other zinc supplements, it is meant to help maintain healthy skin, ears, and eyes. The price for 2.2 lbs of this powder is $19.96. Mushrooms are a superfood rich in vitamins like D and B (Riboflavin), plus important minerals for your body like Selenium, Phosphorus, Copper, Niacin, Zinc, Folate, Magnesium, Iron, and Pantothenic Acid. 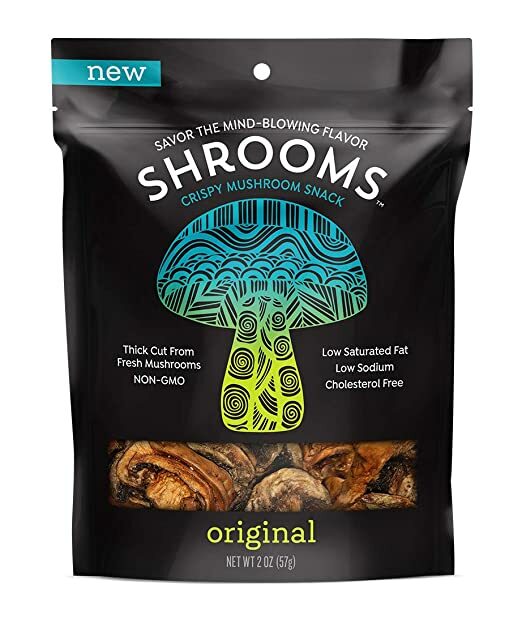 These Shrooms Mushroom Crisps are a vegan, gluten-free, soy-free, nut-free, Kosher, and Non-GMO snack—a fun way to get some zinc in your body! They’re available in 5 flavors: Mesquite BBQ, Original, Pizza, Sea Salt, and Spicy Jalapeño for $5.99. 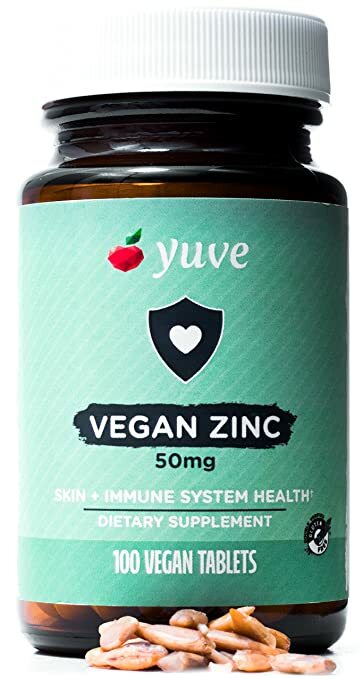 We hope you find the perfect zinc supplement for your health needs! Be sure to check out 10 Zinc-Rich Plant-Based Recipes to Keep You Strong and Healthy and download our Food Monster App for more. The app has over 15,000 vegan and allergy-friendly recipes. Subscribers get 10 new recipes every day!